Although not one of the most popular, one of the most consistently viewed posts on this blog is the carbine setup article that I wrote back in 2015. To my mind, this speaks to the undeniable popularity of the AR-15. Given the continued assault on our rights and renewed efforts to legislate a ban on so-called “assault weapons,” I thought it was time to update the article. In doing so, I’ve borrowed heavily from my original article while trying to address current trends. As of early 2019, here are my thoughts for those of you that may have recently bought an AR-15 or have one that you’re interested in setting up for defensive purposes. If you don’t own an AR-15, now would be a good time to purchase one! Note that I am a civilian and my carbines are set up accordingly. I don’t (yet) have IR lasers or night vision and I’m not qualified to discuss their use. Rather, I have tried very hard to “stay in my lane” with this article, writing simply as an American gun owner who owns a few black rifles and has taken several relevant classes with them. As with much on this blog, this material is primarily directed at civilians, rather than military or police that may have different objectives and requirements. Whatever configuration and accessories you choose for your carbine, I urge you to vet it in training to find out what works and what doesn’t. What follows is my rationale for the guns I’ve purchased and how I have my guns set up, with the caveat that I am a mere civilian who happens to have an intense interest in setting my carbines up for maximum efficiency. For me, the AR-15 is first a tertiary home defense weapon, second a civil defense weapon, and third a natural expression of my interest in firearms. I’ve done a lot of reading and research over the years, and I’ve trained with some of the best in the industry who have been there and done that. My mission (and the mission of most civilians) is about as far removed as possible from that of a Tier 1 Operator, but much of the basic equipment is the same. Here are my thoughts on the subject. This term is bandied about a lot, but what does it really mean? I think it’s a good starting point, but it’s not the end all be all. The reason that my backup carbine is now relegated to being a backup is because I initially wanted and thought I needed a mil-spec carbine when I started my AR-15 journey… remember that mil-spec is closely tied to lowest bidder! That’s not necessarily a bad thing, but nor is it necessarily a good thing. Choose wisely, and remember that you often get what you pay for. If nothing else, spend your money on a quality upper from a reputable manufacturer. For a civilian defense carbine, I think either a 16 inch or 14.5 inch barrel with a pinned muzzle device is a good compromise. You can certainly go shorter if you venture into NFA territory with a SBR (as I have), or you could get an 18-20 inch barrel (but that would be a rifle instead of a carbine). By and large, I have gravitated towards 14.5 inch barrels with pinned muzzle devices to bring them to minimum legal length for my guns (keep in mind that I am short and of small stature). Many will no doubt advocate for a 16 inch barrel to avoid a pinned muzzle device, and I do not disagree with that premise. I just happen to prefer mine short, just like my women! When I first became interested in the AR-15 and eventually ordered a Stag Arms 14.5 inch upper to mate to a pre-ban lower, I chose the shorter barrel specifically because Stag Arms didn’t offer a mid-length gas system. Indeed, if I were going to buy a 16 inch barrel upper, I would select a manufacturer that offered a mid-length gas system. This is because of the underlying design of the direct impingement system employed in the AR-15. If you compare the rifle length gas system on a 20 inch barrel, a mid-length gas system on a 16 inch barrel, and a carbine length gas system on a 14.5 inch barrel, you will note that the distance between the gas port and the muzzle on all three are approximately equal at 7 inches. There is a reason for this. Moving away from the original design represents a compromise to achieve different design parameters. This is one reason that short barreled ARs have a reputation for being finicky. The AR was originally designed around the rifle length gas system. Subsequent design compromises have been necessary to make the shorter gas systems run reliably. Having said that, one recent innovation by manufacturers is to utilize longer gas systems on shorter barrels. As opposed to using the legacy carbine length gas system with 16 inch barrels, the current trend of 14.5 inch mid-length or 18 inch rifle length uppers yields a softer shooting weapon with less wear and tear on components. Indeed, my BCM 14.5 inch mid-length upper is the softest shooting carbine that I own. With appropriate ammunition and spring and buffer combinations, it runs like a Swiss watch! Similarly, my 10.5 inch SBR upper utilizes a carbine length gas system and I’ve had no issues with it thus far. I mentioned appropriate spring and buffer combinations above. I’m not going to delve to deeply here, but suffice it to say, your AR-15 should cycle reliably when dirty and lock the bolt back on an empty magazine. Ideally, when viewed from above, with the barrel at 12 o’clock, your ejection pattern will deposit the spent cases between roughly 3 to 4 o’clock. I have accomplished this with my carbines using Sprinco springs and appropriate buffer weights. Usually, this means an H2 buffer. If you want to take a deeper dive into this subject, I would encourage you to read Mike Pannone’s thoughts on the subject of carbine reliability. For the record, I am not necessarily a fan of adjustable gas blocks. The Gemtech Suppressed Bolt Carrier is an entirely different matter, but alas, I don’t have one yet. Regarding barrel materials, I will offer a very few general observations. Chrome-moly steel and stainless steel are common options. The chrome-moly barrels typically have chrome lined chambers and bores (or at least the good ones do), while the stainless barrels are generally unlined. These days, there are also nitrided barrels, with comparable benefits to chrome lining. Stainless steel is purported to be more accurate, and chrome lined bores are often cited as being more durable and easier to clean. I have examples of both. One thing that I’ve noticed is that my stainless steel SBR barrel heats up much faster than my other barrels. On a hot summer day, with my suppressor attached, it becomes too hot to touch after only a few rounds downrange. The counterpoint is that it also dissipates heat faster. I’ll go over the build details of my SBR a bit later. Common twist rates for ARs are 1/7, 1/8, and 1/9. It probably doesn’t matter too much which you choose unless you are planning to shoot either very light or very heavy bullets. All of mine are 1/7 in order to be able to handle the heaviest bullet weights while still offering adequate performance with the common 55 grain FMJ. If you’re not familiar with the term, twist rate refers to the number of rotations of the bullet in a given distance, expressed in inches. A 1/7 twist rate means that the projectile will complete one rotation every 7 inches as it travels down the bore. A 1/7 twist rate is therefore “faster” than a 1/9 twist rate, and the rotation is what stabilizes the projectile in flight. The original M16 barrel had a twist rate of 1/12. That was later changed to the current standard in order to stabilize the longer and heavier tracer rounds used by the military. Caliber is a whole ‘nother can of worms, but the short answer is that you can safely shoot .223 ammunition in a carbine chambered for 5.56. The opposite is not necessarily true. For that reason, I suggest choosing a barrel chambered for 5.56. There are more muzzle devices on the market than I could even begin to describe, but let me break them down into two major categories. Basically, there are either flash hiders or muzzle brakes and compensators. In almost all instances, I’m going to recommend that you go with a flash hider. In my experience, most if not all muzzle brakes result in a lot of muzzle blast and noise. Maybe not for the shooter, but if you are next to anybody when firing, they’re not going to like you very much. They are just generally obnoxious. The only time I think a true muzzle brake may be appropriate is if it’s utilized as a suppressor mount and therefore shields the first few suppressor baffles from wear and tear. There are also some hybrid designs. I tried a PWS FSC (Flash Suppressing Compensator) for a while, but ultimately removed it because of how ungodly loud it was. However, my BCM upper has a pinned and welded BCMGUNFIGHTER Compensator Mod 1, and I really can’t complain about it. If you have a choice that is not dictated by asinine local legislation, then I still think a quality flash hider is the way to go. There’s nothing wrong with the A2 style birdcage, but if you want to upgrade, the Smith Enterprises Vortex Flash Suppressor is a really nice, albeit expensive, option that doesn’t have to be timed with a crush or peel washer. For my carbines equipped with flash hiders I use another three prong design, the AAC 51T Blackout Flash Hider, simply because it allows me to use my one suppressor on multiple uppers. I took my first carbine class with Paul Howe at CSAT using iron sights. While I think it was an invaluable experience, and while I still keep a carbine equipped only with iron sights, I also think that optics are ubiquitous for good reason today. 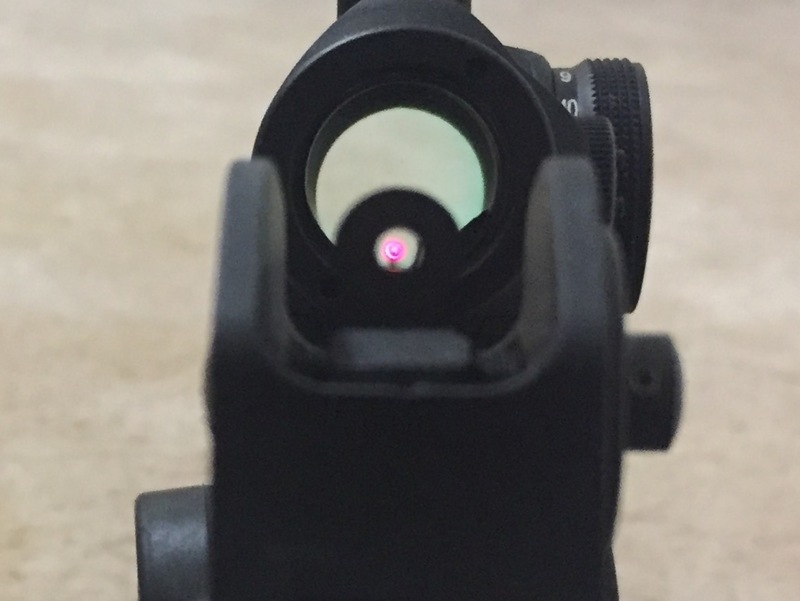 Whether you choose a non-magnified red dot sight or a magnified optic is going to be largely based on your intended usage. I think most urban dwelling civilian carbine owners using the carbine for defensive purposes in and around their homes are going to be well served with a quality red dot sight. I’m going to further specifically suggest an Aimpoint sight. This suggestion is predicated on rugged durability, remarkable battery life, and cost. Leave the sight on all the time and change the battery annually on a specific anniversary or holiday. I am also of the opinion that with non-magnified red dot sights, back up iron sights are mandatory on a fighting rifle. I don’t really think it matters whether you run fixed or folding BUIS with a RDS, but there are some mounting considerations depending on which you choose. As of this writing, I have both on various carbines. For fixed iron sights, I think a lower 1/3 co-witness optic mount is the most appropriate option. While some may find the sight picture with fixed sights in the field of view too “busy,” with a lower 1/3 co-witness it doesn’t bother me. I can say this with confidence having used this exact setup in more than one class. Having said that, with folding BUIS that are kept folded down unless needed, I think an absolute co-witness red dot mount may work better. Similar to my explanation above, this just means that the red dot and irons will coincide with the dot centered in the field of view. This simply comes down to consistency. Whether shooting a carbine with iron sights, a red dot, or a low power variable optic, the height above bore will be the same. Continuing briefly on the topic of iron sights, I have same plane rear sight apertures on most of my guns. This means that when I switch between the small and large aperture of the sight, there is no shift in my point of impact. The original M16 iron sights were designed with long range and close range apertures. Flipping between the two apertures resulted in a change in point of impact that was in theory supposed to account for bullet trajectory. A few schemes have been developed over the years to deal with the elevation turret that was later added to the rear sight, but considering typical domestic carbine engagement ranges outside of the military context, I think a same plane aperture sight is a better idea. XS sights makes a nice same plane aperture sight that even has one aperture offset slightly to account for the shift in windage when the aperture rotates on the adjustment screw. Flip to the large aperture for close range engagements and use the small aperture to zero and for longer range targets. Another good option is the CSAT rear sight aperture also offered by XS that was designed by Paul Howe. You can read more about that option here. The sighting system that is now becoming more and more prominent (if not dominant) is a low power variable optic (LPVO). These scopes are designed to offer the best of both worlds, with a true 1x at the low end and moderate magnification available as needed for threat identification and discrimination. To really make the system viable for close range, you need to purchase one of the few scopes that actually offers a daytime visible red dot. 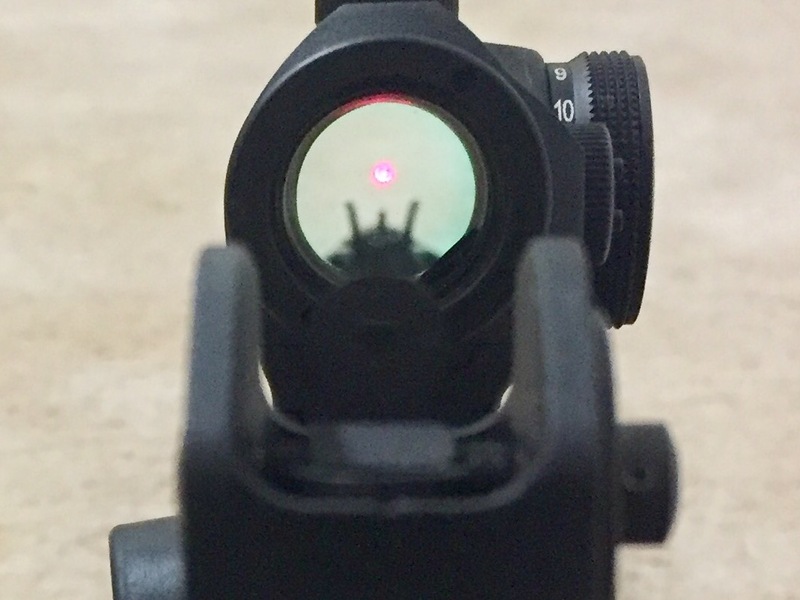 Many have illuminated reticles, but very few actually offer sufficient illumination for use as a red dot sight in bright sunlight. I held off on the concept for a long time, primarily due to cost, but now have one carbine equipped with a LPVO. When Robert upgraded to a newer and better scope on his carbine, I purchased his Leupold VX-R Patrol scope. While it is not a true 1x at the bottom end, it does have a daytime visible red dot and uses mil turrets with a mil reticle. For my purposes, it works just fine. Before acquiring the Leupold, the only other AR specific magnified optic I owned was a Trijicon TA02 4×32 LED ACOG. The ACOG is bombproof, but suffers from poor eye relief and the fixed magnification is not necessarily ideal for the close quarter environments in which civilian owners would most likely employ a carbine. Rather, I envision the ACOG as more of a general purpose optic for outdoor use. Having said that, with the ACOG’s LED illuminated reticle, in close quarters the Binden Aiming Concept does work. As a further point of discussion, I’m no longer convinced that BUIS are absolutely necessary with modern scopes that do not depend on batteries to function. In other words, with illuminated scopes, the etched reticle is still perfectly usable in case of battery or electronics failure. Both the Leupold VX-R Patrol and TA02 ACOG fall into this category. Point in fact, my ACOG did once suffer a failure of the LED illumination that was remedied under warranty. Nonetheless, the optic was still usable due to the etched reticle. Some notable instructors no longer even use BUIS on their rifles. John “Shrek” McPhee and Frank Proctor are two that I know of. Grant Cunningham has also weighed in on the subject and I find his line of reasoning to be similar to mine. That is, BUIS are only really needed when your primary sight is dependent on batteries or electronics to create a dot or reticle. Having said that, I still have BUIS on all of mine. They don’t add a lot of weight, and don’t take up much rail space. Since well over half of our lives are spent in darkness (or indoors), and since carbines generally require two hands to operate, I think a weapon mounted light is necessary on a carbine intended for fighting. When choosing a weapon mounted light, I think the 12 o’clock mounting location offers some distinct advantages. First, the location offers easy ambidextrous access. (With a Surefire X300U specifically, the switch activation is identical no matter which hand is used.) Second, any barrel shadow in the beam pattern will be where it is least noticeable and least critical, namely below your line of vision. Finally, having the light body at 12 o’clock positions the light in an ideal position to be used with cover or barricades to either side with the light in line with the sighting system. Even if you have to cant your weapon to fit through an opening, if you can visualize the target, the light will fit! There are several options when choosing a 12 o’clock mounted light depending on your budget and preferences, with the “Rhino” setup being common. Pictured below, it gets its name from its appearance, and is accomplished by placing an X300U or similar in front of a fixed front sight. Although the carbine pictured below now wears the aforementioned Leupold and a set of folding BUIS, I liked the sights and light combo enough to move it over to my SBR. Surefire X300U mounted in front of a Daniel Defense fixed front sight… an easy ambidextrous option! For general purpose use, it’s really hard to go wrong with a set of Daniel Defense fixed irons and a U-Boat. With the new X300U now boasting 1000 lumens, the combo is even more viable. If I were starting with blank slate today or had more disposable income, Scalarworks makes some very nice sights and mounts, but I really can’t justify the cost as an upgrade any time soon! If for whatever reason a 12 o’clock light mount won’t work on your carbine (my backup carbine with its fixed front sight tower and carbine length rail is one example), then I think an 11 or 1 o’clock offset position is the next best option. No matter where or how you ultimately choose to mount your light, I would suggest having it above the bore and as far forward as possible. Just make sure you can reach it easily and reliably activate it with either hand. For those of you that are considering an offset mounting position, Frank Proctor Performance Gear has some neat options that are extremely low profile and relatively inexpensive to set up as well. Another relative newcomer to the weapon mounted light scene is Cloud Defensive with their Optimized Weapon Light (OWL) and other innovative products and solutions. I haven’t seen one in person yet, but it looks to be a very nice turn key solution, albeit an expensive one. While I have a Streamlight ProTac Rail Mount light pictured here on my backup carbine, I would honestly prefer the more expensive tried and true Surefire Scout light for an offset mount weaponlight. The basic Surefire Scout can be had for the same money that will buy an X300U, so it really just depends on which is more appropriate for your gun. For me, the Streamlight was an affordable experiment. Mine has worked so far, but I haven’t run it hard. I do know that a few trainers suggest a 6 o’clock mounted light for good reasons, but with my guns and lights, I definitely prefer the light mounted above the axis of the bore, primarily to keep the thumb activated switching consistent among my long guns. 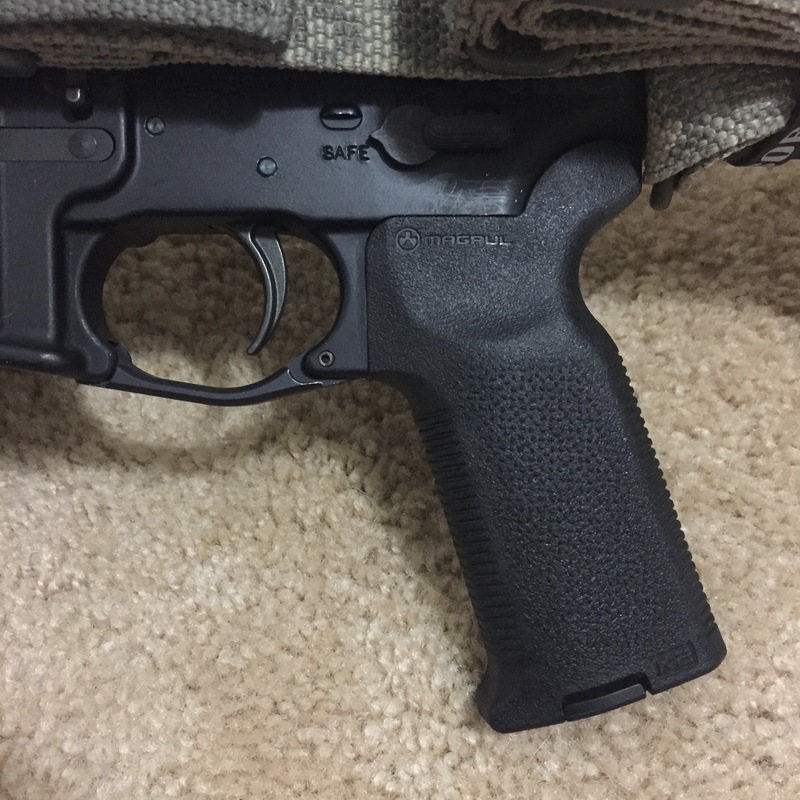 On my backup carbine specifically, I found the rail available behind the fixed front sight base too short to comfortably accommodate a 6 o’clock mount. Also, with the light mounted so far behind the muzzle, the barrel shadow was considerable. I have also played around with a remote switch option on the 12 o’clock rail, but I maintain some concerns about durability, inadvertent activation, and increased complexity that lead me to generally eschew tape switches. Finally, I should note that my frustration with finding a good light mounting option for my backup carbine is what led me to strongly prefer an extended handguard covering a low profile gas block! I’ve heard the comparison that slings are to long guns as holsters are to handguns, and I agree. If you have to use your hands for other tasks or if you must transition to a pistol, a sling is an invaluable and essential accessory. For a variety of reasons, I think having a quick adjust two point sling is ideal. I have a Blue Force Gear VCAS with sewn in QD swivels on each of my carbines, and the slings have worked well for me. The Viking Tactics sling or Sheriff of Baghdad B-Sling are other good choices. In the past, I chose to mount the rear of the sling to the opposite rear of the stock to hold the carbine in tight to the body when slung and to facilitate easier shoulder transitions. Some of my carbines are still set up that way. However, lately I’ve been mounting the rear of the sling to the rear of the receiver near the castle nut as advocated by Defoor. Having run essentially the same carbine both ways (sling attached to stock and sling attached to receiver), I can say that I prefer the latter for easier carbine manipulations. Both methods work, but with multiple QD mounting points on the carbine, I can easily change my setup as dictated by situation or preference. To my mind, one way is better for carrying the gun, and the other is better for fighting with it. Either way, being able to cinch the carbine down tight against your body is key to any sort of activity like climbing or running. Blue Force Gear VCAS with QD sling swivels… note the receiver attachment point, a BCMGUNFIGHTER QD end plate. One further note regarding slings… for storage and use in vehicles, it is strongly advised to fold the sling in on itself and band it to the collapsed stock in such a way that it will be deployed either when the stock is extended or by pulling it out as needed. Sheriff of Baghdad Combat Bands work well for this purpose, as does a short piece of inner tube. The BCMGUNFIGHTER Stock is specifically designed for this… and that is the stock that I will probably purchase if I ever need or want a different one. There is nothing wrong with the stock AR-15 trigger. Having said that, many shooters prefer an aftermarket trigger for enhanced performance. I personally like the ALG Defense ACT trigger. It offers mil-spec reliability, is an excellent value for the price point, and offers enhanced performance over the stock AR trigger. I also have an ALG Defense QMS trigger in another gun, and it is also a definite improvement over the stock trigger. Many people like Geissele triggers, and they offer more models than I can even begin to list, but I’m happy with my choices. (ALG Defense is in fact a sister company to Geissele Automatics…) I would caution against excessively light or adjustable triggers intended for competition being used in a carbine intended for self-defense. I personally want my trigger to be dead nuts reliable when I need the gun to go bang! There are a plethora of aftermarket handguards available from a multitude of manufacturers these days. Personally, I am a fan of the rails offered by Centurion Arms. Whether you choose a slick, a Picatinny quad, a KeyMod, or an M-Lok handguard, I think that light weight and extended length are paramount. The extended length allows you to place your support hand wherever it is comfortable and convenient, allows you to easily configure your lights and sights to work together, and makes shooting around cover while using that cover as a rest easier. For me, 12 inches is a comfortable medium. While drop-in handguards are easy to install, I prefer handguards that free float the barrel. As well, it is worth noting that USSOCOM has officially selected M-Lok over other contenders after reviewing testing conducted by NSWC-Crane. Choose whatever works for you, but take the above into account when selecting a handguard. As far as rail mounted accessories are concerned, I think sights and lights are appropriate. 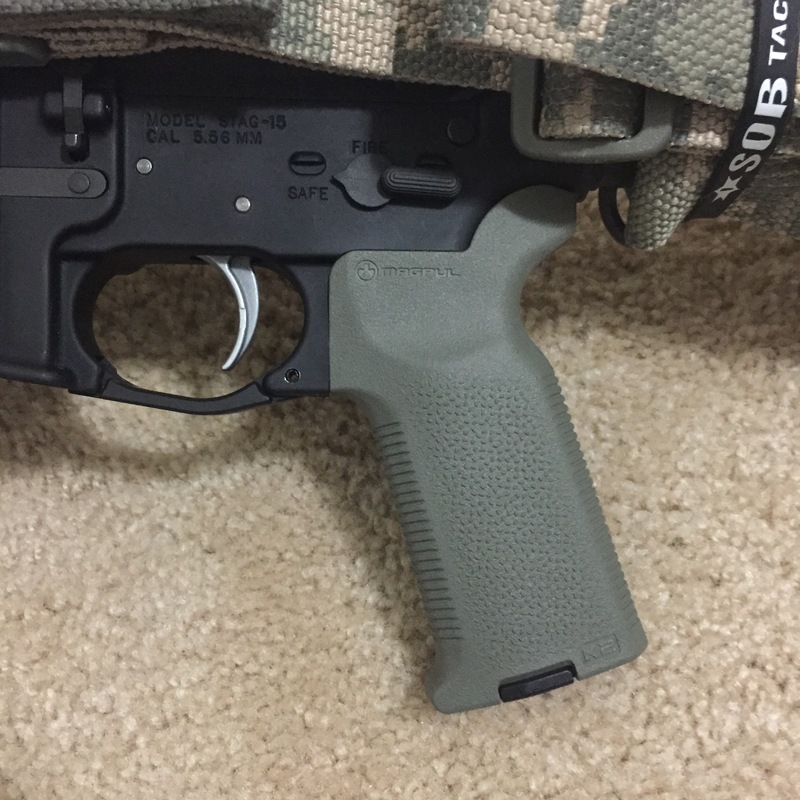 I don’t really care for vertical fore grips, as they essentially lock my hand into one spot on the handguard even though different positions and scenarios may require different hand placements. Every time I’ve tried running a VFG on my carbine in training, I’ve wound up removing it in favor of running the carbine slick. As with everything, YMMV! Obviously, other accessories mounted on the rail may confound the issue of hand placement. If a VFG is used, then I think it is probably best placed far forward on the handguard so that the proper hand placement for the kneeling and prone positions can be maintained. This is yet one more reason that I like extended free float rails. A good rule of thumb (no pun intended) is to find your ideal support hand placement and then attach your accessories accordingly. I like the MagPul CTR stock myself… it does everything I need it to with aplomb. There are once again many good options to choose from, and having an adjustable stock is a good thing. I personally run mine one click in for an ideal length of pull for my stature. Similarly, there are several aftermarket grips available, choose one that fits your hand. I like the MagPul MOE-K2 version for consistency among my guns. The steeper grip angle of the MOE-K2 works well on all my ARs, so I just run the same grip on all of them. The only other accessories that I universally install on any carbine are a BCM Gunfighter charging handle and a MagPul Enhanced trigger guard. That’s it. Discussing all of the accessories available for the AR-15 in today’s marketplace would result in an endless article. Instead, I want to say a few brief words about what you don’t necessarily need! I am not a fan of ambidextrous controls or other bolt release enhancements. The only possible exception that I haven’t yet evaluated but that I think makes sense is the Redi-Catch offering from Redi-Mag that allows the bolt hold open to be actuated with the magazine release. It appears simple to install with minimal impact on weapon handling. As far as ambidextrous controls are concerned, I’ve learned how to perform left handed carbine manipulations, and the specific procedures are simple and effective. I just don’t see the point in unnecessarily complicating a standardized simple and reliable system. Furthermore, with more than one carbine in the safe, adding the same accessories to each carbine for the sake of consistency gets expensive fast! The exception to the above advice is that there are now new AR-15 designs that come from the factory with fully ambidextrous controls. I’m just not a fan of retrofitting older guns or traditional designs to try and accomplish the same thing I can do with simple manipulations that cost me nothing. When I attended Bill Rapier’s Integrated Combatives class a couple of years ago, he took a few moments during a break to briefly outline his thoughts on carbine setup. I largely followed his suggestions when I assembled my SBR, and I thought I might explain it here as an example to further illustrate the discussion points above. Rapier’s advice was to start with a forged Mil-Spec upper and lower receiver and a free float handguard. Then, to spend your money on a quality flash suppressor, an appropriate optic, a good barrel, and an improved trigger, in that order. I already had a forged lower that I had earmarked for the project. Next, I ordered a blemished upper receiver from Bravo Company during one of their sales. I’m hard pressed to find the blemish, but I was happy with the price! For my handguard, I chose a CMR rail from Centurion Arms. The flash suppressor, as I explained above, was a no-brainer. I used an AAC 51T flash suppressor in order to be able to mount my suppressor to the gun. For an appropriate optic, I installed my Aimpoint T1 onto the gun. Given the anticipated role of my SBR, I consider the Aimpoint to be an appropriate optic. I also installed the aforementioned Daniel Defense fixed iron sights and an X300U, as detailed above. I had on hand a White Oak Armament Match grade stainless steel 10.5 inch barrel that I chose to use for this build. Finally, I installed an ALG Defense ACT trigger in the lower, along with the other lower receiver furniture that I mentioned above. Waiting on my tax stamp gave me plenty of time to gather all the components. Rather than try to assemble everything myself (which I did briefly contemplate), I had the upper components professionally assembled at the same time that I had my lower receiver engraved. Frankenguns sometimes have a poor reputation for reliability, so having my upper professionally assembled was worth it in my opinion. If you choose to go this route, make sure that you’re starting with quality components. This alone will go a long way toward avoiding frustration and problems. The easy button is choosing a quality upper or complete rifle that suits your needs and desires. If I hadn’t already had the WOA barrel, I would have simply purchased an appropriate complete upper assembly, probably from BCM. As always, thanks for reading. If you’re not already, follow us here on the blog or on our social media. Questions, comments, and civil discourse are welcome. Be advised that some of the embedded links above lead to our Amazon Affiliate page. We appreciate your support, and using our Amazon link for your shopping benefits us at no extra cost to you! Posted in AR-15, Home Defense, New Gun Owners.Tagged Aimpoint, ALG Defense, BCM, Blue Force Gear, Bravo Company (BCM), BUIS, Cloud Defensive OWL, CSAT, Daniel Defense, Kyle Defoor, Leupold, Magpul, Mike Pannone, Optics, Paul Howe, Scalarworks, sheriff of baghdad, Trijicon ACOG, Viking Tactics.